Indian food is one of my favorite cuisines. It’s also becoming quite trendy. In New York, Whole Foods has even included a hot bar/buffet of Indian Food in their prepared food section. There is still room for improvement in the quality of mainstream Indian food but I think my grandmother would have been as pleased as I am to see this flavorful cuisine take off. There are a few Indian style recipes in her book, “The Art of Good Cooking,” such as Curried Carrots and Peppers and Indian Beef Curry which I’ve done for this blog. Like many of her international recipes, these were unique and practically ground breaking when they were written in the 1960’s – before what some may consider the food revolution. The availability of spices like ground coriander, turmeric, cumin seeds, or garam masala have come a long way since then. 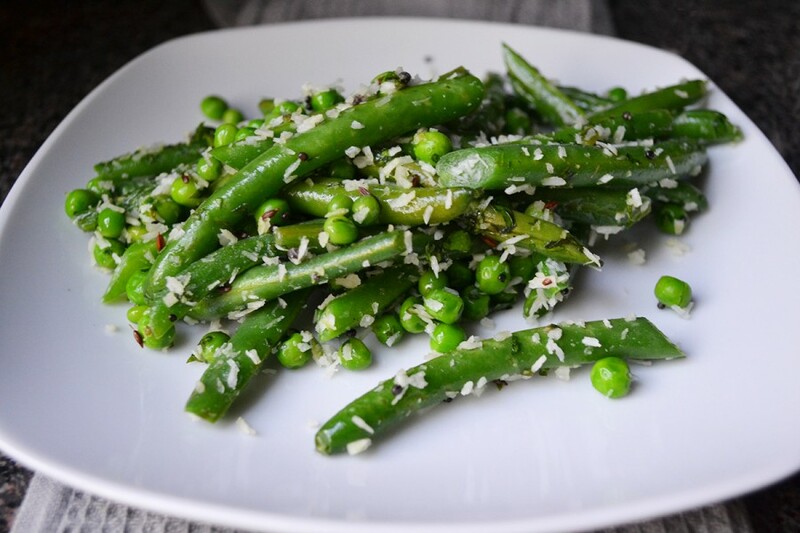 I, however; didn’t begin to enjoy Indian food until my late teens when my step mother introduced healthy and flavorful north Indian style recipes such as this coconut green bean and peas dish. I used to think that Indian food was way too spicy and had too much cream or oil, making the spices taste muddled. Unfortunately, there are still many restaurants that make it this way. I actually find that there are very few places that produce really good Indian food – the way my step mother introduced it to me. This style, which is also similar to the cooking style of celebrity chef Madhur Jaffrey, focuses more on the freshness of the main ingredients that bring out the unique flavors in each of the dry spices. There are many recipes that use this technique – this just happens to be one of my favorites. The combination of sweet peas and green beans with the spices and Serrano pepper is a great way to add diversity to your vegetables. The coconut adds an unexpected tropical component that’s surprisingly tasty. There are so many different textures in this dish yet they all seem to come together with each spiced bite. It’s often served along side a protein like chicken but if you’re like me (or you’re a vegetarian) and you enjoy just eating green vegetables by themselves or as a snack, this makes an excellent alternative to those boring boiled green beans. Heat a medium-large pot of water over high heat until boiling. Salt water and add green beans to blanch, 3-4 minutes. Drain immediately. In a large wide skillet, heat oil over medium-high heat. Add urad dal (if using), mustard seeds, and cumin seeds. Cook for one minute, stirring constantly. Add the Serrano pepper and reduce heat to medium. Cook for another minute until mustard seeds begin to pop. Be careful not to burn the seeds. Add the green beans and stir. Cook for 3-5 minutes. Add the peas and stir. Cook another 10 minutes or until green beans are tender, stirring frequently. Add the shredded coconut and chopped cilantro. Cook for one minute. Season with salt and pepper to taste. Remove from heat. Stir well before serving. Hi Gina, I’m Megan (my grandmother was Paula). Yes it could definitely be made ahead of time and served at room temp. The spices blend together even better after sitting for a few hours or overnight. Thanks for commenting!